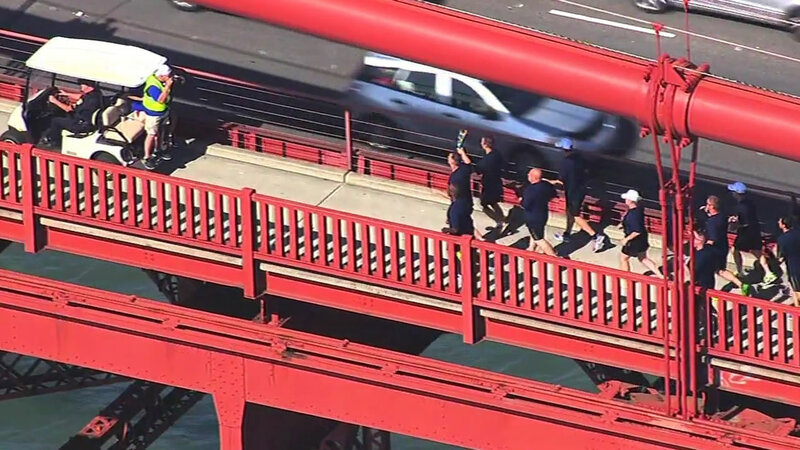 SAN FRANCISCO (KGO) -- ABC7 News was at the Golden Gate Bridge Wednesday morning as a team of law enforcement officers from across the world carried the Special Olympics' Light of Hope torch across the span. "The athletes themselves are what we do this for, for making sure that they have the opportunities to participate in sports and programs," said Julie Bowman. Sky7 HD captured the scene as they crossed the bridge. The torch will arrive on July 25 at the Los Angeles Memorial Coliseum to ignite the cauldron for the opening ceremony. It will be delivered during the final leg of the Law Enforcement Torch Run, with the help of a team consisting of 98 law enforcement runners and 10 Special Olympics athletes. The LETR for the Special Olympics is the largest grassroots fundraiser and public awareness event in the world. More than 90,000 law enforcement members from all 50 states, 12 Canadian provinces and territories and 44 other countries contribute to the run annually. The group was started 34 years ago by Wichita Police Chief Richard LaMunyon and five law enforcement officers who were carrying the torch for the Special Olympics Kansas Summer Games in Wichita. "For more than 30 years the Law Enforcement Torch Run has been an integral part of the Special Olympics movement," said Patrick McClenahan, president and CEO of the Special Olympics World Games. "We look forward to seeing Californians cheering on the runners as they bring the world games message of acceptance and inclusion throughout the state." The final leg of the run began July 13 through July 25. The run started in Sacramento and consists of three routes spanning 4,648 miles that will all merge in Los Angeles.